Now for something a bit lighter. I thought I knew what a shoe tree was, but I was wrong! Sometimes when skating we see shoe power lines and I wonder what kid cried over that loss, but this is pretty amazing stuff. I guess a lot of drinks and bets went down at the old disc golf course. Who knew? Maybe the golfers ended up in the weed(s)? It would be cool to have a tree of "misbegotten speed boots" or a rec boot tree...but I guess giving them away or ebaying them (almost the same?) is a better option...keep the wheels on the streets and feet. Submitted by eebee on Wed Jan 9 2008 11:34pm. Well that looks a whole lot more elegant than (Georgia) Stone Mountain Park's 'Gum Rock', about two-thirds of the way up the mountain. 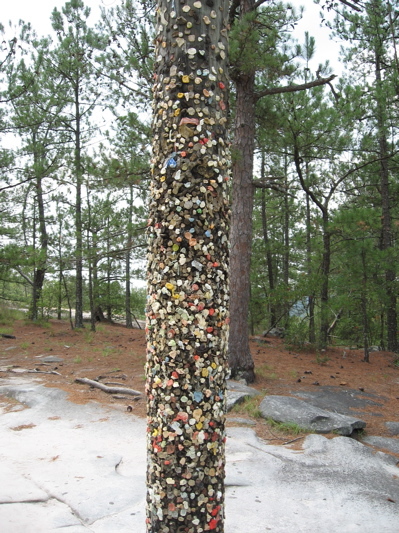 Here's a picture of the nearby 'Gum Tree', which is actually a cable pole decorated with gasping hikers' stale gum. 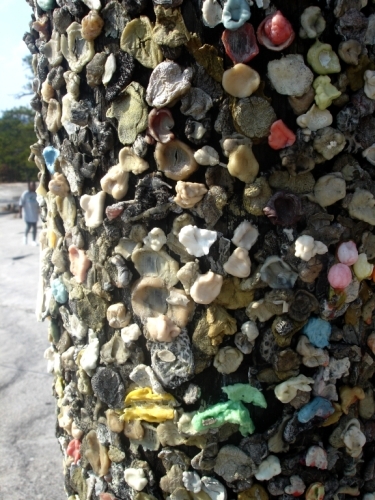 The Gum Rock of course is a huge boulder covered in the same. Submitted by timv on Thu Jan 10 2008 7:03am. You aren't the only one who has wondered about this. Bullies take them off defenceless kids, then sling them up out of reach as the ultimate taunt. Submitted by roadskater on Thu Apr 3 2008 8:37pm. OK not really, but while watching "My Name Is Earl," I heard another explanation. In answer to a "what are the chances" question, Joy's answer was "about the same as he spontaneously combusted" or similar. Darnell says "the government doesn't want you to know there's a lot more spontaneous combustion than you think. That's why you see so many tennis shoes on power lines," or words to that effect. OK. Now I understand! Submitted by roadskater on Wed Jan 5 2011 7:30pm. It looks like another shoe tree has been hacked down. Some local businesses say it brought visitors and money to their deserted place. Perhaps someone not liking visitors did the work. If they had to get rid of the shoes and skates and slippers and else, OK, maybe, but sad about the tree.